Response card: Champagne Italian pearlized cardstock. You print and cut from letter-sized sheets, or we print and deliver finished size. NOTE: Be sure to click the proper radio button to select printing options. *****DISCONTINUED****** Luminous and Sparkly - Purity Wedding Invitations. All ivory and champagne colored paper - this handmade paper wrapper is like a cloud enveloping your wedding card. 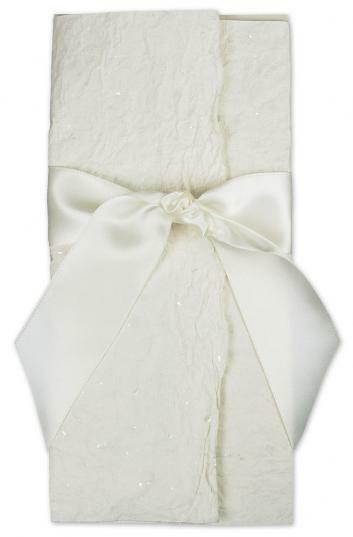 Closes with ivory satin ribbon. DIY: Easy. Style: Tall and Glamorous - this invitation is all shimmer and shine. Overall Size: 10 inches tall x 5 inches wide ( a standard stamp size - however the bow adds an extra 20 cents due to the 'bump'. ) Finished invitation measures 9-1/2" x 4-3/4" Handmade cotton rag invitation wrapper with a complex crinkled texture. Wrapper is scored and diecut, for easy assembly. Invitation is printed on milkweed recycled cardstock. Closes with a yard of 1.5 inch double face satin ribbon. Envelope:Matching pearlescent champagne 70 lb. handsome envelope. Custom envelope - with a 4 inch flap at the top. (designed by and manufactured exclusively for Invitesite ). Colors: Champagne and ivory. Wrapper: Handmade cotton rag. Scored and die-cut. Video Instructions:Check out our how-to videos for tying a perfect french knot.